Princess Eugenie arrives for the charity film Premiere of Sharkwater Extinction, at the Curzon Cinema in Soho central London. 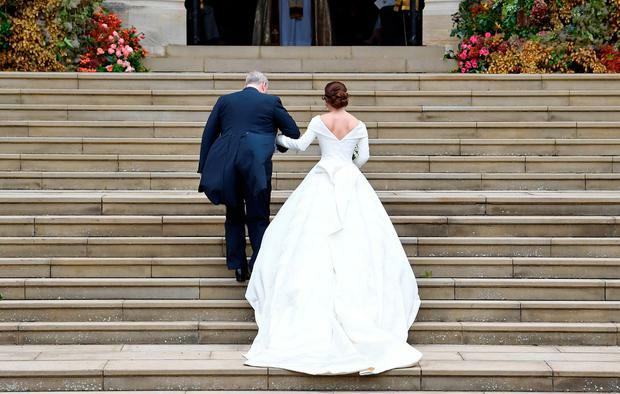 Britain’s Princess Eugenie has revealed how her wedding dress was specifically designed to reveal her scar from a scoliosis operation she underwent as a child. The 28-year-old, who is the Queen’s grand daughter, said she told her dress designers that she wanted to show her back and scar – and it became the centrepoint of the dress. “After one or two initial meetings where I said I wanted to show my back and scar, we had a fitting and in their first attempt at the shape and design of the dress, they got me and the vision in one,” she told The Telegraph newspaper. She added: “I believe scars are like memories that tell a story on your body, that remind you how strong you had to be, and that you survived to talk about it." Eugenie married Jack Brooksbank in October, and walked down the aisle of St George’s Chapel in her bespoke Christopher de Vos and Peter Pilotto gown, with its folded neckline and full skirt. The back of the dress fell in the shape of a deep-V to show off, rather than hide, a scar which runs neatly down the length of her spine. Eugenie was diagnosed with scoliosis aged 11 and underwent an eight-hour surgery a year later during which her back was rebuilt with titanium.